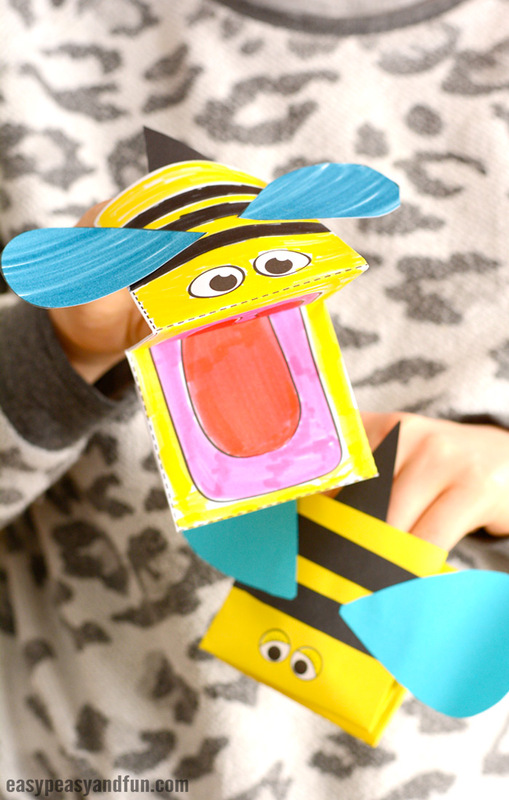 We’re back with another wonderful printable puppet that’s a true chatterbox – grab this printable bee puppet, color it and fold your own, or follow the tutorial to make one with a piece of yellow paper. Either way, it will be a whole lot of buggy fun that’s perfect for spring time. With the temperatures rising all kinds of amazing (and eeeek) bugs start coming out. Bee’s are one of the most important bugs on our planet and teaching kids about them and what their role is is really important. 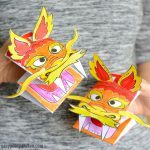 These little buys workers make a great unit theme for kindergarten and these printable puppets (or crafted without a template) will make a great craft activity for that unit study. 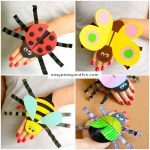 Naturally you can just make them for fun too, as they certainly are a fun spring craft for kids to make. 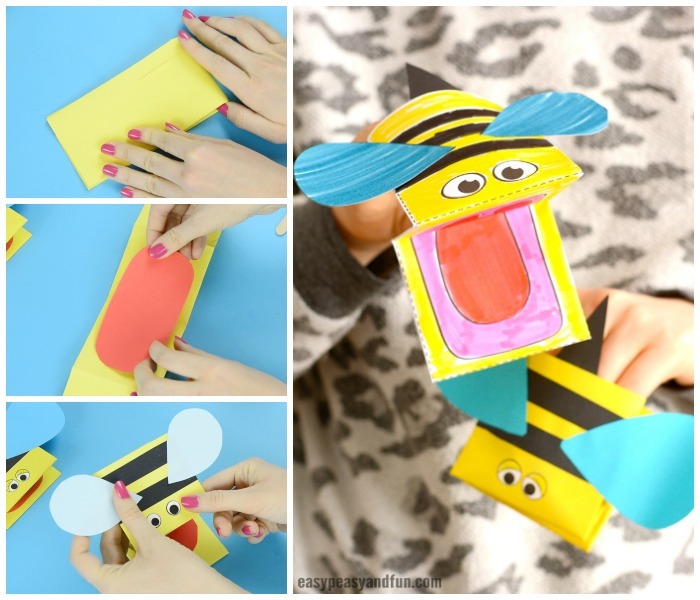 Ready to make your bee? 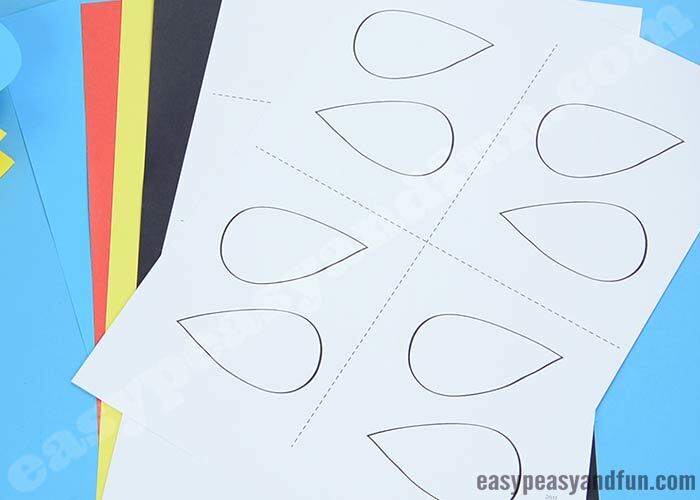 Print our template and let’s get crafting! 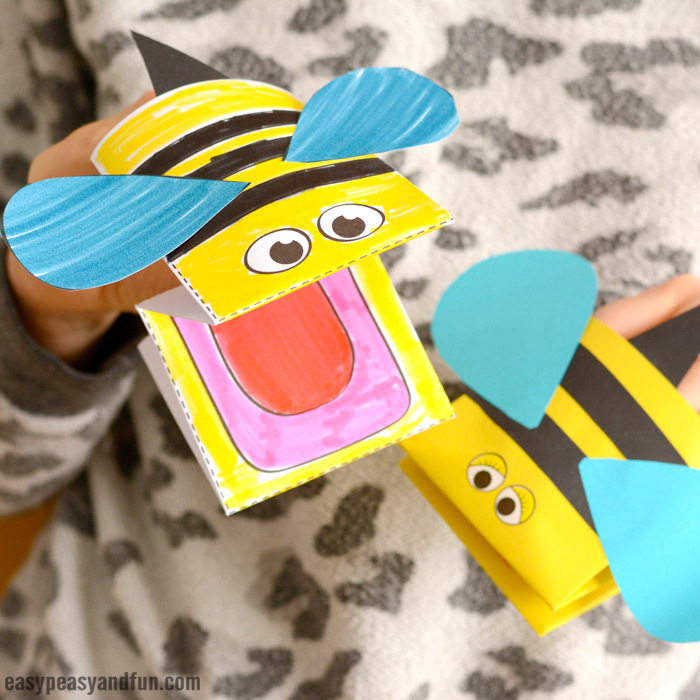 How to Make a Printable Bee Puppet (with or without the template). 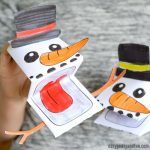 If using our template (you can grab it at the end of the tutorial) – print it on heavier print paper (it will make them more durable and easier to color with markers). 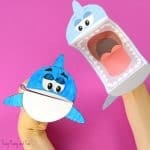 Regular print paper will work out OK too, but wont make the puppets as durable as heavier print one (cardstock) and coloring with markers isn’t what we recommend for regular print paper as it can wrinkle. 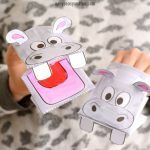 If you’ll have the kids color it in with crayons or colorin pencils, regular paper will be perfect. 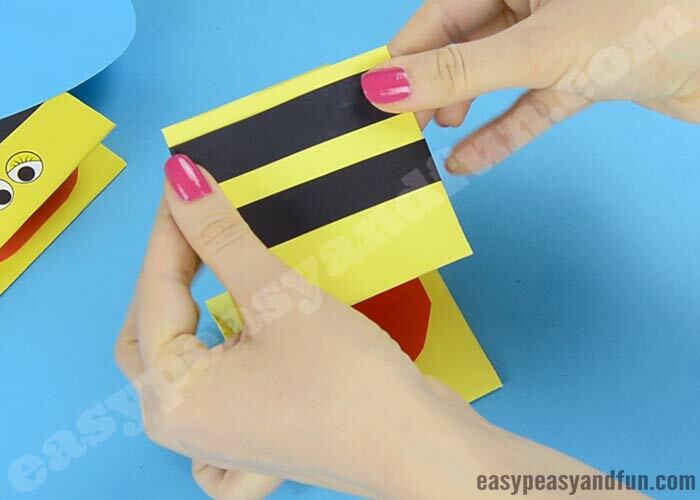 Start by coloring in the bee design on the template. If working with our template, fold along all dashed lines. With regular yellow paper, fold into thirds lenghtwise. The last fold goes over the first one. Glue the last fold on the first third. Fold in half (crosswise). If you’re using our template you’ll see the dashed lines indicating the folds. 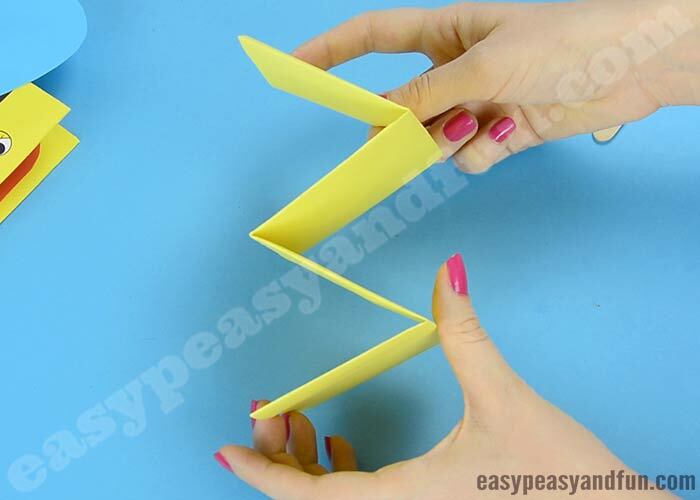 You need to fold the “open” end layers in half again. Once you fold them both, you’ll end up with a M shape. Let’s decorate! 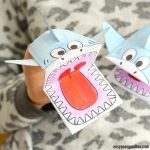 Cut the red tongue/mouth and stick it inside your puppet. 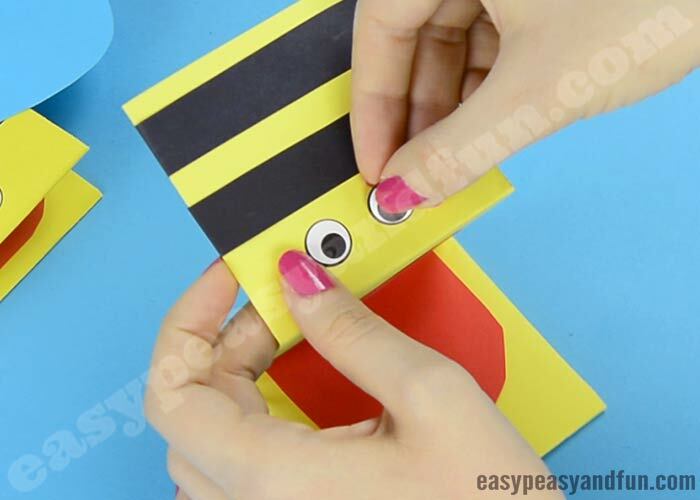 Also cut a few strips of back paper and glue it onto your bee puppet. And the eyes! Both wiggle eye stickers and wiggly eyes work out well. Add the wings and the stinger.